Here is the ~silentsparrow~ creator, hyasynth Tiramisu, in her own kiri suit in the mist color. She's wearing Calico Creations Calico hair in silver, and Shiny Things Chunky Ribbon Boots. If you look closely, you can see that the necklace and earrings she's wearing are not-yet-released Shiny Things as well, the Mechanica set. Mmmm. ~ silentsparrow~ had a limited edition hunt today for the kiri suit. There might even be a few left on the sim! How to describe the suit. It is formal dark Victorian wear with impeccable prim tails and cuffs and jabot, with enough bits for men as well as women in the box (almost enough for a suit each), and brocade that makes me want to lick the fabric. Do you have a sim that feels like home away from home? ~silentsparrow~ is like that for me. On nights when I feel like people watching, I head to a quiet corner of the store, park myself on one of the comfy couches, and stare at the nice avatars as they stare at clothing. I especially love it when they put on their new outfits. I own most of ~silentsparrow~, I admit it (my group tag isn't "twittery fangirl" for nothing), but I love seeing how different everyone looks. 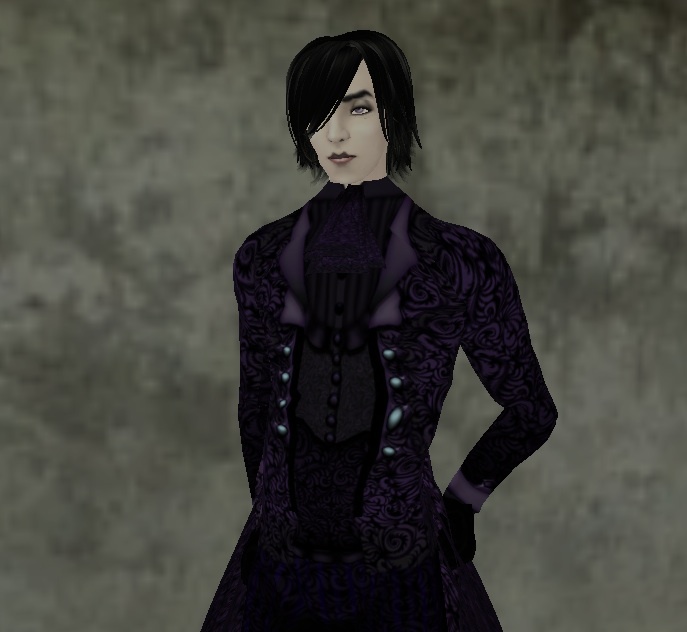 This is something that I love about Second Life clothing. We can all have on exactly the same thing, but because our bodies, skins, hair and -- and taste are so different, we all look different. It's just like real life, only everything actually fits (and damn, I envy my avatar's ability to wear just about anything s/he wants). My boy av is in the dusk color, looking like some sort of debauched Oscar Wilde character. He's humming Velvet Underground's I'm waiting for my man. Heh, I'm still licking my suit, it's so gorgeous!